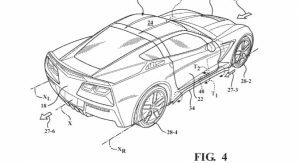 General Motors has secured a series of patents for various active aerodynamic parts that could be used by the C8-generation Corvette – although, for obvious reasons (like not giving away the C8’s design) a current Stingray is displayed. 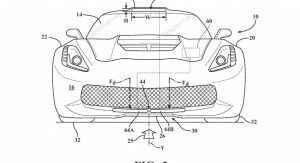 Three new patents recently discovered by Corvette Blogger show that the automaker is working on Active Side Skirts, Active Spoilers, and Downforce Generating Ducts. 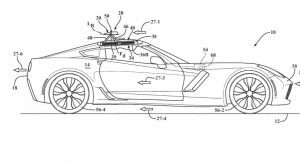 The detailed patents show exactly how the individual parts will work and provide a hint of just how focused the long-awaited, mid-engine Corvette will be. First up with have the Active Side Skirts. 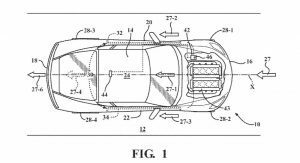 GM’s patented technology uses sensors which detect the rotating speed of the wheel and the speed of the vehicle relative to the road surface. A controller has then be programmed to send commands to actuators which can extend and retract the side skirts. 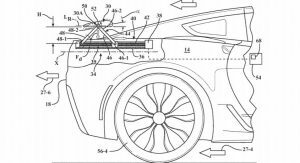 In their extended position, the active side skirts will help to lower the aerodynamic drag of the car. Also being developed are various Active Spoilers. 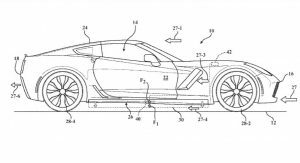 The patent images reveal a rear wing which can have its height varied through a gear and motor system. 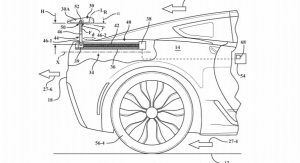 Additionally, a system is able to pivot the body of the spoiler to change the angle of attack and alter how much downforce is generated. 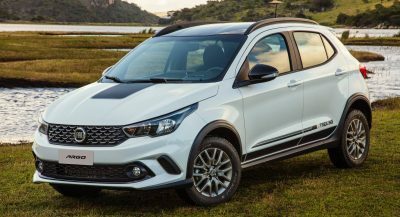 Additionally, the Active Spoilers incorporates sensors that measure the rotating speed of the rear wheels and the velocity of ambient airflow relative to the vehicle. Further sensors gather data about the steering wheel angle and yaw rate to best determine the required height and angle of the spoiler. 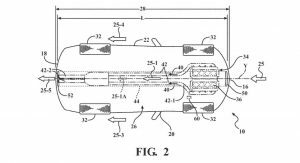 Included in the patent are depictions of a wing which could extend out of the roof. Last, but not least, we have the so-called Downforce Generating Ducts. 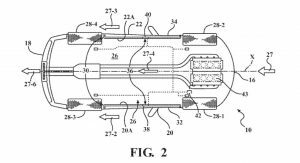 GM’s patent describes ducts containing entry and exit ports which funnel air across various surfaces of the vehicle’s body, impacting downforce levels. 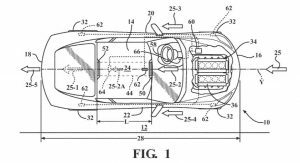 The patent depicts these ducts at both the top and bottom of the car. 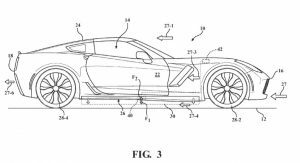 According to reports, the mid-engine C8 Corvette will premiere at the 2019 North American International Auto Show. 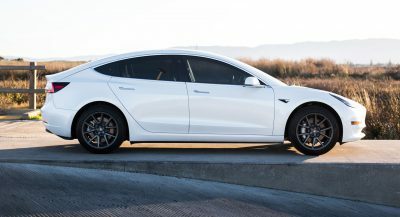 A host of variants will be offered, including one with a 5.5-liter flat-plane crank V8 delivering at least 600 hp and a hybrid twin-turbo V8 with roughly 1000 hp. Maybe it’s trying to see if wheels are slipping and shifting downforce accordingly? 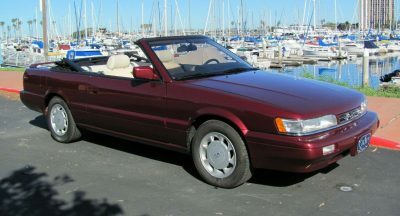 possibly speedometers are known to be off. Is that flat plane 5.5L V8 confirmed? Also, I’m very excited to hear the C8 will have active aero! That’s great news. 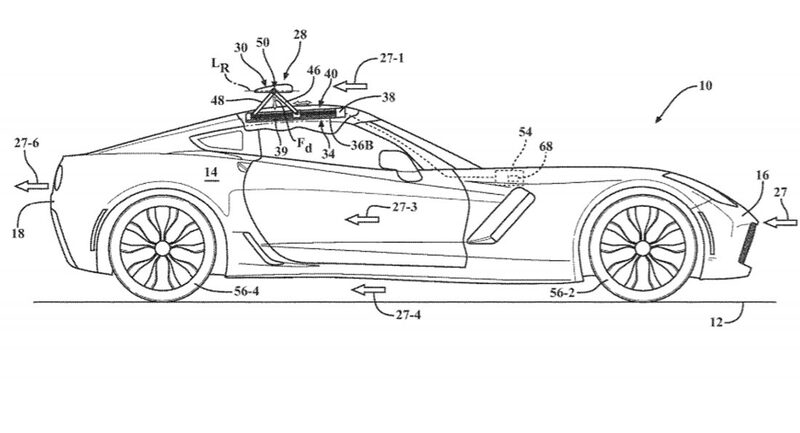 I just wish they at least put an active rear wing and front airdam on the C7 because the Z06 (with that stupid/inefficient wickerbill spoiler) and the ZR1 desperately need an active system. Previous PostPrevious 2019 BMW X4 Is A Quality Item With A Polarizing Design, But Is It Sporty Enough?